Submitted by Alexander Briones on Feb. 27, 2018. Originally published on Feb 2, 2017 and most recently updated on Feb 28, 2018. This is our 2018 updated guide to mic preamps - single channel mic preamps continue to dominate in terms of ratings. Stand alone mic preamps are a great way to enhance the quality and character of your microphone recordings as well as allowing you to add extra mic enabled channels to your setup. Ordinary preamps built into audio interfaces and mixing desks are usually solid performers but dedicated preamps can add that extra warmth and clarity, helping to bring out the best in your microphones. Although they are most often lauded for vocal recordings, many also find that these mic preamps can be great for acoustic instruments and even live vocals. Check out our updated list of the best microphone preamps for under $1000, featuring top rated single- and multi-channel mic preamps. Here are the top mic preamps in the entry level market, ideal for beginners, or those who are looking to improve their recording options and sound quality without spending too much. 89 out of 100. Incorporating 125+ ratings and reviews. 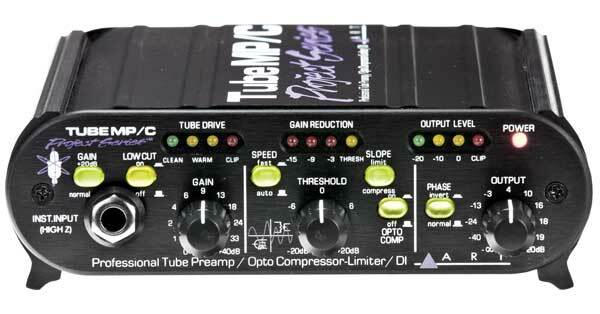 For just under $100, the ART Tube MP/C is a value packed preamp, complete with genuine tube and compressor. It can be used to add tube coloration for recording or live performance, with the added benefit of an opto-compressor effect that evens out the sound nicely and a variety of tone shaping controls. Speaking of tube, the ART Tube MP/C has a single 12AX7 that drives its circuit, which includes a nifty 20dB gain boost and a low-cut filter. While it is mostly used for adding warmth to vocals, it can also be used to improve the sound of instruments in recording situations. Dimensions: 1.75" x 6.5" x 5.9"
Overall response to the ARt Tube MP/C is favorable, with most users experiencing dramatic improvements to their sound. This is especially true with vocal recording, but there are many who report getting great results in live singing and public speaking, including pulpit preaching, emceeing and more. Guitarists and bassists also consider it as a cheap way to add analog warmth to digital amp modelers. Paul White of Sound on Sound concludes his review saying: "As long as you keep an eye on that input clip LED, though, you'll find the ART Tube MP/C makes a versatile and musical-sounding front end". There are a few who are not too happy with the gain boost function, which seem to add unwanted noise. Some experienced users also noted that the tube quality is not as good as their more expensive preamps, but are happy with how it sounds considering its affordable price tag. Given its price and sound quality, the ART Tube MP/C is an easy recommendation for those looking to add analog tube warmth to their live performances and recordings. 91 out of 100. Incorporating 275+ ratings and reviews. The DBX 286s is a versatile mic preamp with built-in vocal processing capabilities. It starts off with a solid state mic preamp with switchable 80Hz high pass filter, phantom power and variable gain. But what sets it apart is its very useful compression, de-esser and expander/gate section, all of which allow for flexibility that other preamps don't have, along with convenient yet deep control over the resulting sound that makes it viable for different vocal styles and even musical instruments. Dimensions: 1.75" x 5.75" x 19"
From podcasting, to home recording, to live performance, many report that this mic preamp can do it all, and do it well at that. For something affordable, it is quite notable that its sound quality gets a lot of praise. As expected, value for money is also one of its strong points, making it accessible for beginners, while still having good enough features for experienced users to appreciate. There are some who complained about the lack of output options, which prompted some users to modify or replace their cables to make the unit work with their existing gear. If you are looking for a reliable, versatile and affordable mic preamp, then do yourself a favor and get the DBX 286s. These days, Behringer is virtually everywhere in the entry level market, and they're raking in great reviews while they're at it. Case in point is the ADA8200, a mic preamp that gives you eight channels with MIDAS designed preamps. Considering its affordable price tag, this preamp houses eight mic channels, more than enough to appease many users. Controls are straightforward, with just a gain knob and phantom power switch. The ADA8200 is often paired with ADAT compatible audio interfaces, like the Focusrite 18i20, Focusrite 18i8 and Presonus Audiobox 1818VSL input. Dimensions: 1.75" x 8.5" x 19"
Overall market impression continues to be favorable for the Behringer ADA8200, with many thanking it mostly for the extra features that they are getting for their money. Many are more than happy with its eight channel design, but it's not just the additional preamps that helped propel this product up top, even its sound quality is said to be good. There are some who commented that they can hear the difference in quality when compared with more expensive preamps. Still, they are more than happy with its performance, given its price. If budget is limited and you're looking to expand your input options for recording and live situations, then check out the Behringer ADA8200. 87 out of 100. Incorporating 200+ ratings and reviews. The ART Pro MPA-II is a 2-channel tube-driven microphone preamplifier, designed to reproduce the natural warmth of old preamps. It utilises 12AX7 tubes to get the job done, with a wider than usual frequency response and enough gain for working with ribbon mics. It is housed in a rackmount form factor with an old school looking interface complete with backlit analog VU output meters. For the price, this unit is armed with a 60dB gain knob, input impedance control and lowcut filters, all of which allow for a good level of control over the resulting sound. Finally, it supports dual-mono and stereo operation, so it can tackle stereo tracks and recordings with ease. Output Connectors: 2 x XLR, 2 x 1/4"
Dimensions: 3.5" x 8.75" x 19"
Quite a lot of reviewers were pleasantly surprised with the sound quality of this preamp, especially when considering its price. Some thanked it for breathing new life to their recordings when cranked, while others use it subtly and appreciate how it smooths rough edges for a more polished result. While most reported using this amp in conjunction with vocal recording, there were others who had good results when using the unit for recording other instruments. There are some who were not too happy with the resulting coloration, but this is more of a preference issue than quality. There are even those who have switched out the factory installed tube and reported better results. There were also a few who cautions others to handle the unit with care, after they experienced build quality issues. Highly recommended if you're looking to try what tube preamps can do to your recordings and you're on a tight budget. The Pre-73 MKIII is Golden Age's reasonably priced nod to the classic Neve 1073, featuring vintage style tone coloration courtesy of its solid state design with Tantalum capacitors. This single-channel preamp gives you up to 80dB of gain, which makes it compatible with passive ribbon mics, while the highpass filter and 2-position high-frequency boost allows for sound shaping. Finally, the unit is housed in a red mini-rack form factor that is easy on the eyes and sturdy enough to survive regular use. Output Connectors: 1 x XLR, 1 x 1/4"
Most reviewers agree that the Golden Age Pre-73 MKIII is a great tool to add to any studio. Many commend this unit for adding life to their vocal tracks, while others found it to be very useful for use with ribbon mics when recording acoustic instruments. There are a few who complained about build quality, like a user who reports that the power switch scratches on the metal housing. Add analog vibe to your recordings with the Golden Age Pre-73 MKIII, highly recommended. The ART Voice Channel is a full featured tube preamp with built-in dynamics processor, EQ and digital output, and rightly so because Advanced Research and Technology or ART designed it to be an all-one-one preamp solution. At the core of this unit is a class A tube preamp circuit with a 12AX7 tube, selectable voltage plate and variable impedance - which makes the preamp by itself quite versatile. Factor in its other features which include gate, compressor, expander, de-esser and parametric EQ - and you get a truly versatile preamp that can even do digital recording via its built-in analog to digital converter and USB output for direct recording. Dimensions: 3.5" x 9.17" x 19"
Outstanding and affordable don't usually go together in reviews, but there are many who share both sentiments after trying out the Art Voice Channel. It's value for money is often commended, as well as its versatility. Many are also impressed with the quality of its sound, which some even compare to more expensive preamps. Some experienced users who already have dedicated gear for compression and EQ are not as impressed with its feature set. But there are some who are quite pleased with the preamp sound quality. Those who want a more straightforward preamp find the Art Voice Channel to be too complex for their liking. Packed with extra features, the ART Voice Channel is highly recommended for those looking for more value for their money. We quote Sound on Sound's Mike Senior: "If you need a lot of control for tracking a wide variety of different instruments and vocalists, the Voice Channel's parameter‑rich multi‑processing will make sonic problem‑solving a great deal easier." Here we look in detail at the top mic preamps that retail between $500 and $1000, all of which are ready for professional use, while still accessible enough for home studios. 95 out of 100. Incorporating 50+ ratings and reviews. What the Grace Design m101 lacks in features, it makes up for with its top notch build and sound quality. It is a mic and instrument preamp that utilizes premium components like 0.5% precision metal film resistors for signal clarity and a 12-position gold-plated rotary gain switch. It also features improved RFI suppression for studio quality clear and quiet performance. Finally, it has a ribbon mode that applies more gain and phantom power protection for workiing with ribbon mics. 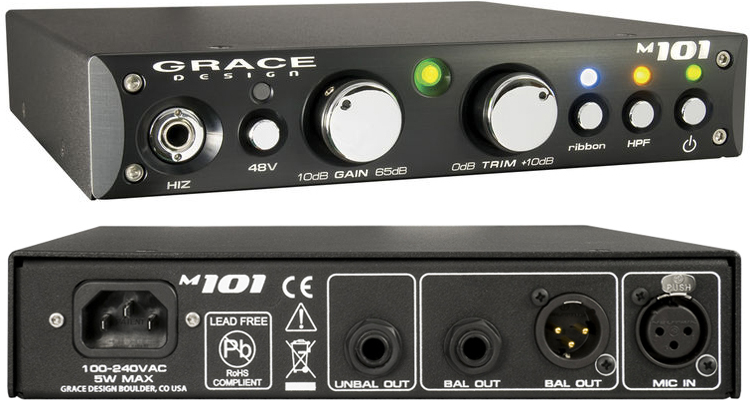 Dimensions: 1.7" x 9" x 8.5"
Incredible and wonderful are just two of the many positive adjectives that people use to describe the Grace Design m101 preamp. Most of the commendations point to its sound clarity, while others are satisfied with its straightforward operation, where there is no need for complex tone shaping and tweaking. There are no notable complaints about the m101, which is quite impressive given that there are many cheaper and more versatile alternatives. If you're looking for a straightforward, studio quiet, and transparent sounding mic preamp, then check out the Grace Design m101. 94 out of 100. Incorporating 40+ ratings and reviews. Popularly used by artists and producers since the '70s, the original Neve 1073 module is widely considered as an industry standard when it comes to mic preamps. And to this day, many manufacturers still try to mimic its sound, like the Golden Age Pre-73 which also made it to this list. The AMS Neve 1073lb is a modern recreation of this iconic console, repacked into a compact form factor to meet the space requirements of today's producers and musicians. It comes with the same components. circuit design and hand-wound transformers that the original had, making it as close as possible to the original - only more portable and reliable. Input Connectors: 1 x Combo XLR-1/4"
Dimensions: 1.5" x 5.25" x 5.75"
Users and experts alike are impressed with how close the AMS Neve 1073LB is to the original release. Experts commend it for its solid build and sound quality, even those who actually own the original 1073 console find this modern recreation to be really good. Nic Hard of Sonic Scoop alludes to this in his review saying: "I would happily track an entire record using the 1073 LB feeling certain that I would get a damn good result." Not many complaints with this one other than a few who had shipping issues. Own a piece of history with this expert approved modern reproduction of the venerable Neve 1073 preamp. Coming from Blue Microphones, it's no surprise that Robbie comes in a distinct looking form factor that looks like a... robot toy. But the premium price tag is an easy giveaway that this is no mere toy, rather Robbie is their flagship tube mic and instrument preamp. Inside this preamp is a class A tube circuit with an ECC88 twin triode, that allows for high gain, while it's zero IC architecture keeps unwanted noise at bay. Input Connectors: 1 x XLR, 1 x 1/4"
Dimensions: 8.5" x 5.25" x 8.25"
The Blue Robbie's crystal clear sound continues to impress users, with many reporting that it exceeded their expectations. Build quality also gets a lot of thumbs up, while others are happy with how easy it is to use - considering the improvement that it adds to the overall sound. While its distinct form factor got a number of commendations, there are a few users who find its shape to be awkward, and wish that it came in a more compact form factor. 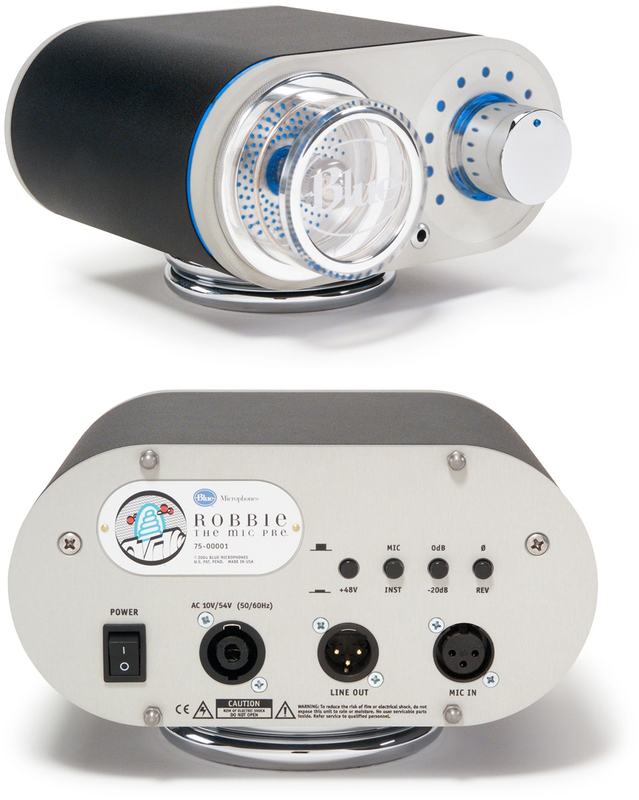 The Blue Robbie's combination of distinct visual appeal, simplicity and premium sound quality makes it a good addition to any studio. This is where we sometimes present additional options which didn't quite fit into our list above but which you may also find interesting and useful. In this case, it's a highly rated mic activator that sits between a preamp and a mic, and enhances the resulting sound. 97 out of 100. Incorporating 250+ ratings and reviews. Cloudlifter CL-1 is not a preamp in itself, but it uses the preamp's phantom power to improve the sound quality of Ribbon and Dynamic mics. It features a specially designed active circuitry that adds +25dB of transparent gain, resulting in better capture of sonic details, and making any preamp compatible with ribbon mics. Since it utilizes phantom power, it can only be used with passive dynamic and ribbon mics. 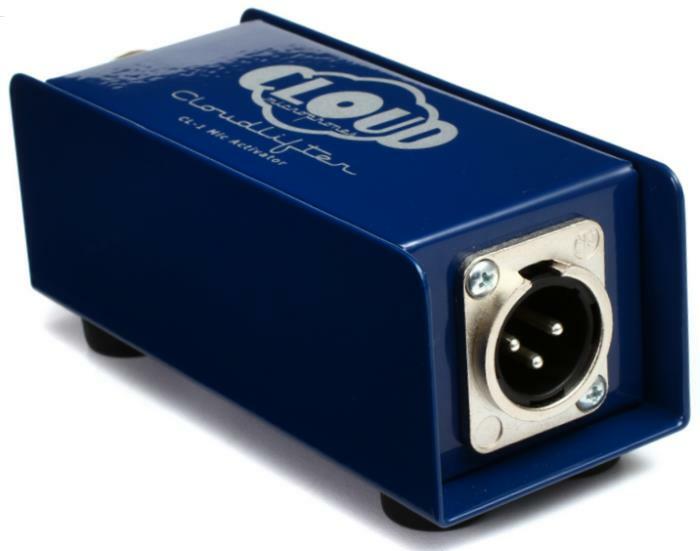 Dimensions: 2" x 4.5" x 2"
The Cloudlifter CL-1 is often described as a mic boost, and rightly so because based on the reviews, it does boost both the volume and sound quality of many mics. Many describe the resulting sound to be quieter and cleaner, attesting to its usefulness in capturing the human voice, be it for singing, podcasting, chatting and many more. When paired with a ribbon mic, reports have been positive, it has also satisfied users who have used it to mike acoustic guitars and other instruments. "Clean" is an adjective that consistently appeared in many of the reviews, and is an appropriate description of what the CL-1 is all about. With its very high rating, there aren't that many notable concerns with the CL-1. The score would've been higher if not for some users who complained about it's limitation, who wished that it could work with phantom powered mics. If you're not too keen on replacing your preamp and just want a way to improve the sound quality of your dynamic and ribbon mics, then the Cloudlifter CL-1 Mic activator is the way to go. It can also be used to help with long cable runs and if you're looking for an easy to implement clean mic boost. Many of today's audio interfaces come with built-in preamps but, and most of them lean towards transparency, which is all good - until you itch for more. Most Solid State Mic Preamps are made to scratch this itch for better quality, offering improved transparency and more control over the sound. They are also oftentimes transformer-less to reduce sound coloration. When you find yourself looking for vintage-style warmth and coloration, you'll want to go for Tube Mic Preamps that mimic old recording equipment. These mic preamps mimic old school circuitry and components, using actual vacuum tubes and even customized transformers to get as close as possible to the sound of the preamp they are reproducing. While modern production techniques have made these units more reliable, it is still safer to handle these units with care, because of their tube component. Note that coloration and transparency is not limited to the type of circuitry used. There are solid state preamps that are designed to provide vintage style voicings, and there are tube preamps that can be transparent. If you're not sure what you want, you can use the age and style of your favorite tracks as your starting point. Mic preamps are usually designed to improve the quality of vocal recording, but there are some that work just as well for miking instruments like drums, acoustic guitars and amplifiers, some even come with Hi-Z inputs for electric guitars and basses. Transparent ones are normally more versatile, while vintage voiced ones are more limited but they are ideal when trying to recreate a old school voicing. This list is dominated by single channel preamps as they are usually used for vocals and mostly to augment a setup which already has a number of "standard" preamps. It makes sense to have a higher quality option on the most important tracks without breaking the bank. Just remember that single channel units are limited, you can't do stereo recording with them so look out for the 2 channel preamps in this list if this is what you need. Multi-channel mic preamps (often 8 channel) are usually of the transparent variety and are used to expand the number of mic input channels available. Most of these offer ADAT outputs to connect an audio interface although the line outputs can be used. So check to see if your audio interface has ADAT if you want to take advantage of this. Aside from the basic XLR input to TRS line level output that characterizes mic preamps, many offer a range of other I/O options. Other input ports include 1/4" Hi-Z inputs for instruments like electric guitars, 1/4" TRS line level inputs and 1/4" Return inputs. On the output side the options include XLR and ADAT. If you are looking to expand the capabilities of your ADAT compatible console or audio interface, then you'll want preamps with ADAT output. You'll want a preamp that fits in well with your other gear, and form factor plays an important role. The most commonly used profile is Rackmount because of its convenience. Lunchbox, and desktop friendly form factors are also available. It is also important to know where the ports are placed so you know how to position them. We've included the dimensions and weight (where available) in this list so you can know before purchasing if they will fit into your available space. Important features that you should look out for include phantom power and an input pad. Other features that can be practical include EQ and/or high-pass/low-pass filters, a noise gate and a power switch - you'll be surprised how some seem to skip on this feature. To complete this list, we looked at all widely available standalone preamps that are primarily intended for use with microphones. We filtered out audio interfaces, vocal effect pedals and channel strips to keep the list focused on standalone units. For this update, we ended up shortlisting over 20 mic preamps, along with 5,000+ relevant reviews, ratings, forum discussions and recommendations. All these data were fed to the Gearank Algorithm, resulting in scores that reflect current market sentiments, which we ultimately used to create this guide. Finally, the list is divided into three price ranges, so you can choose one that fits your budget, or prepare for one that requires a bit more investment. For more information on how Gearank works, click here. Submitted by Surya (not verified) on Jul. 10, 2017. I need a preamp mainly for the phantom power source for my blue encore 300 condenser mic, for my vocal performances. I don't need multi channel. As the venues I am performing have serious power issues,is there any preamp that runs on rechargeable batteries without depending on the power at the venues? Submitted by Alexander Briones on Aug. 10, 2017. Vocal Effect Pedals like the TC-Helicon Mic Mechanic 2 can give you what you need. It comes with a built-in mic preamp, it can supply phantom power, and it can run on four AA batteries. Still, no portable mic preamp can help you if the power issues affect the venue's PA system. It also can't save you from the dangers that electrical issues pose, so it would be best to let the venue administration know of any power related problem. Submitted by Jason Horton on Feb. 28, 2018. Submitted by Josh Clegg (not verified) on Jun. 17, 2018. Submitted by Mort Salk (not verified) on Sep. 8, 2018. Can any of your rack units convert the processed analog input to MIDI for output? If not, does any manufacturer rack have this capability? None of the mic preamps or vocal effects processors, that are on our recommended lists have the ability to convert audio to MIDI. Today we removed the Focusrite OctoPre MkII Dynamic Mic Preamp from the recommended list above due to a lack of availability.